Billy Goat has asked us to supply direct to our surrounding areas London, Essex, Hertfordshire and Middlesex to be Fully assembled, Tested, Demonstrated if required by one of our qualified staff and to provide a 100% After-Sale Service to all our future customers. Please call us on 02085203929 to find out more details before purchasing Thank you! 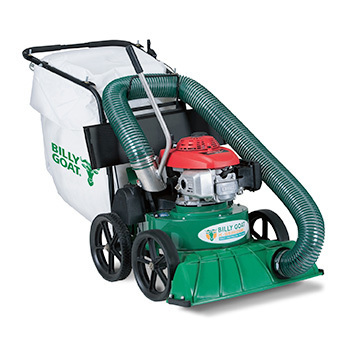 Whether it is residential clean-up for your patio, lawn, driveway, walkway, shrubs, beds, decks, pool areas, trees, parking lots, or fence line – Billy Goat’s new KV vac eats and bags all your yard clean-up chores. An optional hose kit helps between shrubs, beds and under decks or utilities. The new unit features a 5-blade impeller with serrated edges to maximize both suction and debris reduction. Variable height adjustment for either hard surface or turf work, and all the material is accumulated in a breathable-hard bottom mesh turf bag with an integral dust cover. For convenience, bag zippers have been eliminated in favor of simple to use marine style clasps that open and close easily when emptying debris. Honda or Briggs power combine with 12” smooth tread wheels as well as the optional rear-wheel self propelled for hilly turf applications, make operation simple in any environment. Put the power of our 40-year proven and leading brand to work today! Gotta get a Goat! Weight KV650H - 132 lbs. Helps Maneuvering in tight spaces and rolling through leaves. Collect pinecones, leaves, grass clippings, bottles, cans all while walking at a comfortable pace! Keeps Dust Away From Operator's Face.